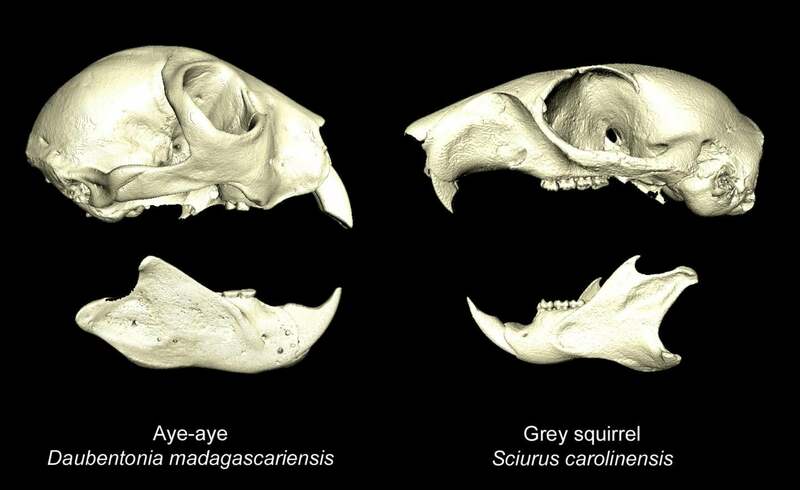 The researchers compiled microCT scans of 46 aye-aye species, either from the Morphosource online database or from specimens in museums. They put them into a computer program that could run a statistical analysis and compare the shapes of the skulls to those of squirrels. They found that the the two species’ skulls had more in common than would be expected by randomness alone, according to the paper recently published in Biology Letters. The researchers thought the similarities could best be explained by the aye-aye’s need to impart lots of force on its teeth. The aye-aye scrapes bark off of trees in order to eat out the bugs, while squirrels crack nuts. That’s how convergent evolution works—similar evolutionary pressures could lead to unrelated but similar-looking animals. But this is just a best guess based on modelling, as we can’t know for certain why these traits evolved.